Her personality, skills and approach are perfectly aligned with what we are trying to achieve. Like Reuben, Polly has many years of practical experience covering large and small animals and Alpacas. She also has a keen interest in general anaesthetics, which makes for a compelling duo. Until now we have been limited in the range of surgical work we could perform without a skilled anaesthetist to assist with the more complex procedures. Now we have Polly! Originally from Cheshire, Polly graduated from Bristol University in 2007 with a Bachelor of Veterinary Science (BVSc) before moving to the South East where she worked in mixed practice gaining a wide breadth and depth of experience. The majority of her time was spent developing specific equine diagnostic and treatment skills. Polly learned to ride aged six and it was her love of horses which set her on the veterinary career path. 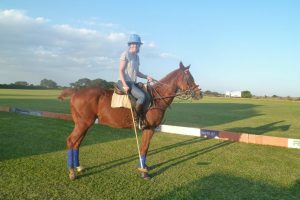 In recent years spent time with family in Africa training and looking after polo ponies. A mother to two boys, Polly spends her “spare” time enjoying the great outdoors with her family, playing tennis, cycling, walking and riding whenever she can.